I have met Pete Best before, and he is a rather nice fellow, especially considering he got a bit of a raw deal with being booted out. 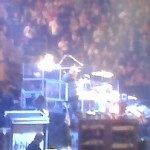 :-/ I love Ringo, but it still stinks for Pete. Born in November, 1941, Pete Best lived in Liverpool as a child, as did all of The Beatles. He joined the band in August of 1960, and was asked to leave the band around August 1962. Unfortunately, Pete states that he never received an explanation as to why he was replaced. Similar to my previous blog post, this is a premier movie ticket for the “Help!” movie. It is unused. The ticket, unused, is around 8 and a half by 4 inches. It’s rather cute! I don’t know what would be better – watching the movie or keeping a piece of fun memorabilia! 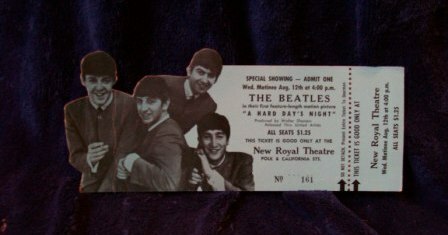 Pictured here is a premier movie ticket to see “A Hard Day’s Night.” This is a movie made in the early 1960s, which starred each of The Beatles. It was sort of a ‘day in the life,’ during which The Beatles shuttled to a television theatre production. The movie showed them being pursued by throngs of fans, rehearsing, and getting into trouble. Of course, there is a ton of great music in the movie! One tidbit that many casual fans do not realize is that George met his first wife on the set of this movie. She is the beautiful blonde on the train – one of two ladies that Paul hits on in the café of the train. 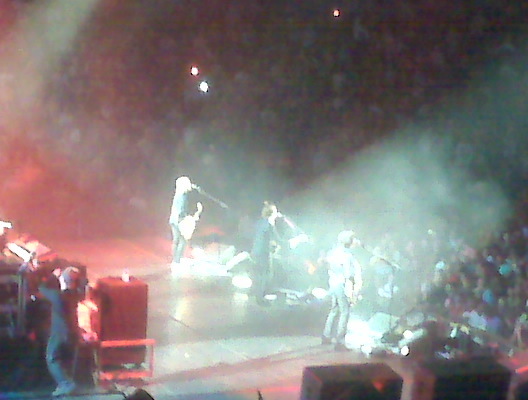 Patty is also pictured as The Beatles leave the train. Later on in life Patty went on to marry Eric Clapton, one of George’s closest friends. 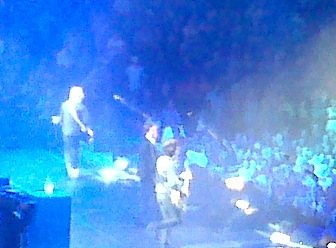 This image is one of a yellow submarine! 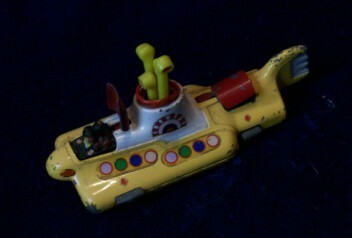 This die-cast metal yellow submarine was manufactured by Corgi and has a movable periscope and pop-up hatches. It’s a little over five inches long and is quite heavy for being such a small item. I had fun finding this item. When I graduated from school, my father and I took a Beatles trip to England. We went to London and Liverpool, site-seeing all of The Beatles’ sites. While in Liverpool, much to my amazement, we went into a five-and-dime antiques shop and I bought this little trinket for, if memory serves me, $10!!! Money well spent! 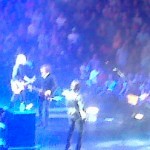 So this blog post is all about McCartney! 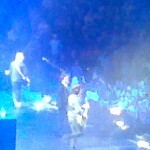 I went to see him in concert with some friends and my mother in Philadelphia this past Sunday. 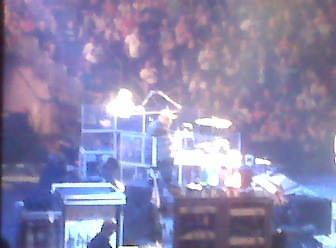 He was absolutely awesome! It was strange – we got one of the cheapest level tickets available, last minute because I happen to be travelling out to Philadelphia that weekend…they were side seating. I have to admit, I thought it was going to be bad. But it was awesome. 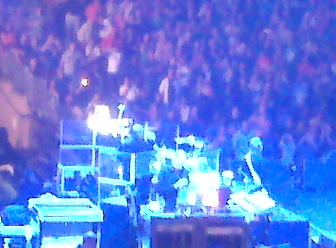 We were quite close to the stage, just with a side view. 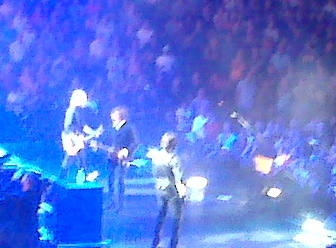 But Paul would often times change to the sides, so we got to see him well. The most fun part of the evening was when a fan made it onstage and got Paul’s autograph on her back in sharpie! I actually read online that she had a tattoo artist go over the autograph and made it a permanent fixture on her body. I have to say, I’d do the same thing. Hehe. 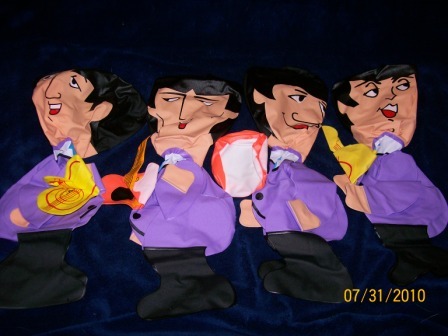 Made in Hong Kong, copyrighted by NEMS Ltd, The Beatles were immortalized as cartoon blow up dolls! 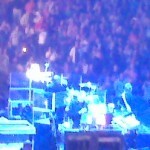 They were made in 1966, and are dressed in purple clothing, accompanied by their instruments. These are a fun toy for kids, though I must admit they aren’t very common! Mine have never been blown up. I was even having my heart skip beats as I took them out of their wrappings! 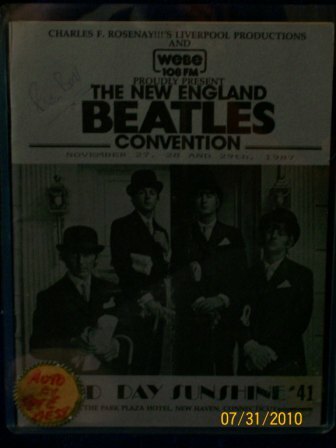 I remember buying these at a Beatles convention about 10 years ago. They were over $100!!! 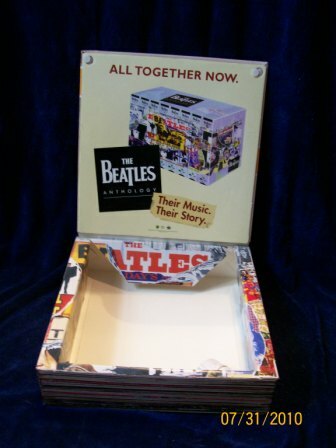 This is the last of my floor displays from The Beatles Anthology series. This one depicts the actual VHS Anthology set, in a 3D display. It’s folded in the photo attached. 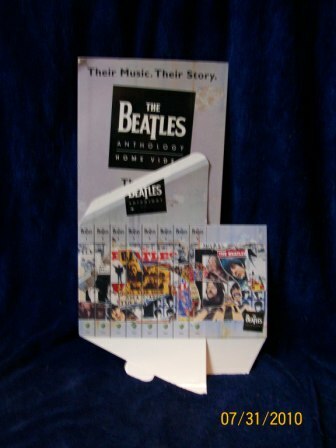 A lot of people do not realize that an Anthology book was also released to commemorate The Beatles Anthology work. The book was released in October of 2000. Many rare photos and interviews are included in the book. It’s rather large – a great piece for your home library! 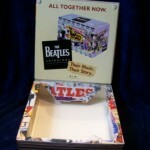 This is another floor display for The Beatles’ Anthology album series. Pictured here is a famous photograph of the Beatles from the late 60s, advertising the Anthology #3 CD. 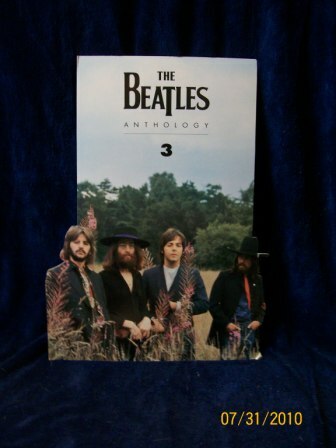 The Anthology disc 3 was released in October 1996 by Apple Records. The musical selections span from the introductory sessions for The Beatles (White Album) to the last sessions for Let It Be and Abbey Road. 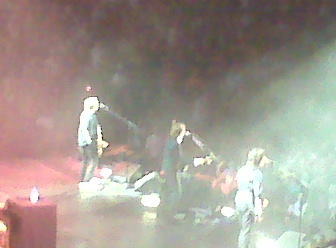 Anyone and everyone knows about the Beatles Anthology! In 1995 The Beatles Anthology aired within the United Kingdom and the United States. 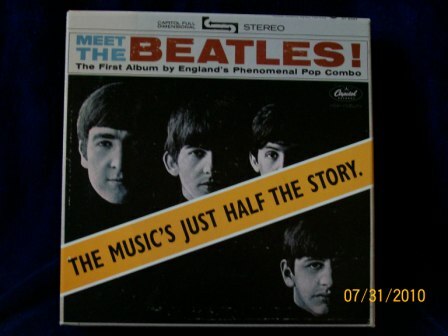 It took about five years to develop, and all three living Beatles (at the time), plus Yoko, came together to tell The Beatles’ story, spanning from the 1940s through the end of the band’s time. 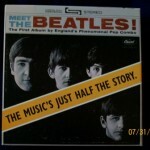 The story is mainly told through archival footage, straight from The Beatles’ mouths. 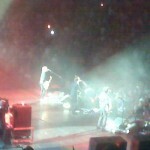 Along with the airing of the documentary, there were three albums of outtakes, rehearsals, and concerts released. 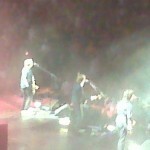 It was an awesome time for any Beatles fan. Pictured here is a floor display for a store, which was used to hold a VHS set of the Anthology documentary. The VHS tapes would be housed in the center of the display in the hole. The cover closes over the tapes, though not with a tight seal. 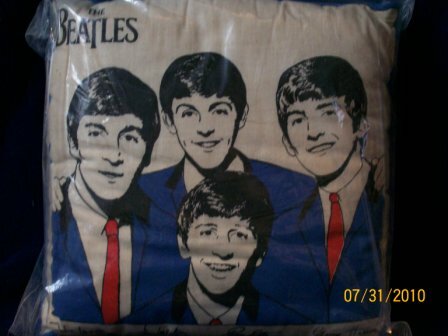 I actually store my Beatles Pillow (from yesterday’s blog posting) in this floor display, for safe keeping! This is a really cute item in my collection! I actually store it in a clear plastic bag, and it never sees the light of day. Hehehe. The pillows were manufactured in 1964 within the United States, licensed under Seltaeb and NEMS. (Notice that’s Beatles spelled backwards. 😉 There were four different kinds of pillows; this one has a blue backing. It is about 11.5” x 11.5”. I’ve also seen these pillows manufactured with red backings. Their worth is in the hundreds of dollars. Pretty good for a pillow, eh?